This Book is like the "Aker's & Aker's Echinoid Book on Steroids"! 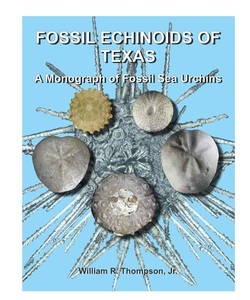 This book is a catalogue of all the currently known fossil echinoids from Texas, which numbers 237 species. In addition to providing the information on previously described species, 1 new genus and 46 new species are recognized from Texas. The new genus is Craneipedina and the echinoids recognized and named herein are Cibaster texanus sp. nov., 'Cidaris' willi sp. nov., Coenholectypus borachoensis sp. nov., Coenholectypus latus sp. nov., Cottaldia magna sp. nov., Craneipedina williamsonensis sp. nov., Crassiholaster bexarensis sp. nov., Cyclaster texanus sp. nov., Desoricidaris tarrantensis sp. nov., Diplopodia doliae sp. nov., Echinometra noblei sp. nov., Echinothuria mccallae sp. nov., Gauthieria parva sp. nov., Globator simoni sp. nov., Glyphocyphus garviei sp. nov., Goniopygus goodlandensis sp. nov., Goniopygus quartus sp. nov., Holanthus texanus sp. nov., Leptosalenia hancockensis sp. nov., Leptosalenia hintei sp. nov., Leptosalenia inflata sp. nov., Leptosalenia maniba sp. nov., Leptosalenia smithi sp. nov., Mellita costabilei sp. nov., Palhemiaster krohi sp. nov., Pedinopsis molineuxae sp. nov., Plegiocidaris pawpawensis sp. nov., Plegiocidaris wenoensis sp. nov., Protocardiaster texanus sp. nov., Prionocidaris anacachoensis sp. nov., Prionocidaris pawpawensis sp. nov., Protocardiaster pocranei sp. nov, Pseudholaster texanus sp. nov., Pseudocidaris ridiculum sp. nov., Pygaster borachoensis sp. nov., Pygorhynchus stephensoni sp. nov., Salenia elliotti sp. nov., Salenia supera sp. nov., Temnocidaris (Hirudocidaris) wenoensis sp. nov., Temnocidaris (Stereocidaris) borachoensis sp. nov., Temnocidaris (Stereocidaris) texanus sp. nov., Tetragramma adami sp. nov., Tetragramma cranei sp. nov., Tetragramma dentonensis sp. nov., Tetragramma donaldtrumpi sp. nov., Tetragramma glenrosensis sp. nov., and Tetragramma hammerschmidti sp. nov. This work aspires to be as thorough and detailed as possible with photos included for all species. All were photographed in high resolution color, with regular echinoids from the adoral, aboral, lateral ambulacral, and lateral interambulacral views. Irregular echinoids were photographed in adoral, aboral, lateral, anterior, and posterior views. In most cases, a single specimen is used to illustrate each species. One hundred six of the specimens photographed were type specimens from the University of Texas Non-vertebrate Paleontology Lab, Louisiana State University Museum of Natural Science and the National Museum of Natural History (Smithsonian). Where types were unavailable, representative specimens were used from both institutions and private collections. Two specimens were contributed by the Mississippi Museum of Natural Science. Four of the representative specimens are from the Akers Collection which is currently owned by Chris Garvie. Many specimens are from the Frank Crane Collection which is currently owned by his son Dr. Stephen Crane. The remaining species are from private collections of William R. Thompson, Jr., Ed Elliott, Chris Garvie, Ron Root, Terry Stephenson, John Hinte, Mike K. Smith, Danny Harlow, James Costabile, Dave Hayward, Paul Hammerschmidt, Linda Farish, Frank Holterhoff, and Raul & Carlos González of the website erizosfosiles.jimdo.com. Each species is described in detail. If the original description was available, that text was included and credited. All the others and the new species' descriptions are the author's. Key Words: echinoid, Texas, fossil, sea urchin, sand dollar, echinoid, heart urchin, geology, paleontology. Temnocidaris (Hirudocidaris) wenoensis sp. nov.
Temnocidaris (Stereocidaris) borachoensis sp. nov.
Temnocidaris (Stereocidaris) texanus sp. nov.
A Pictorial Collection of Fossil Sea Urchins of Texas complete with scientific descriptions. This work aspires to be as thorough and detailed as possible with photos included for all species. All were photographed in high resolution color, with regular echinoids from the adoral, aboral, lateral ambulacral, and lateral interambulacral views. Irregular echinoids were photographed in adoral, aboral, lateral, anterior, and posterior views. In most cases, a single specimen is used to illustrate each species. Eighty Nine of the specimens photographed were type specimens from the University of Texas Non-vertebrate Paleontology Lab, Louisiana State University Museum of Natural Science and the National Museum of Natural History (Smithsonian). Where types were unavailable, representative specimens were used from both institutions and private collections. Two specimens were contributed by the Mississippi Museum of Natural Science. Four of the representative specimens are from the Akers Collection which is currently owned by Chris Garvie. Many specimens are from the Frank Crane Collection which is currently owned by his son Dr. Stephen Crane. The remaining species are from private collections of William R. Thompson, Jr., Ed Elliott, Chris Garvie, Ron Root, Terry Stephenson, John Hinte, Mike K. Smith, Danny Harlow, James Costabile, Dave Hayward, Paul Hammerschmidt, Linda Farish, Dr. Stephen Crane, Frank Holterhoff, and Raul & Carlos González of the website erizosfosiles.jimdo.com. Each species is described in detail. If the original description was available, that text was included and credited. Descriptions which are protected by copyright laws or not available were not included in this publication. Instead, those species' descriptions and the new species' descriptions are the author's. and how to identify the fossil echinoids of Texas. Included are common, rare and many new echinoids. 46 New species and 1 new genus. Photos are in high resolution color.